FROM THE THEATRES TO STORES! Recreating the magic of Yash Raj Films not in the movie theatres, but exclusively at The Bombay Store. The Bombay Store brings you movie merchandise from the house of Yash Raj Films. See the prints & motifs of the timeless classics like- Kabhi Kabhie, Silsila, Lamhe & DDLJ. Not a fan of old school? Try sporting impressions from the roaring hits of today which includes Band Baaja Baraat, Rab Ne Banadi Jodi & Bunty aur Babli! Women can up their glam quotient with filmy pouches, sling bags, scarves, stoles and a lot more. Men too can show off their love for the movies with ties, laptop sleeves, shot glasses, sippers etc. The die-hard Bollywood devotees and romantics can now also adorn their homes with the motifs of their favourite movies & actors. Refresh your homes space with coffee mugs, coasters, table clocks, magazine stands, gift boxes with funky movie prints & patterns. The Bombay Store & Chado Tea bring to you the best of both worlds! The Bombay Store joins hands with the chai expert ‘Chado Tea’, to bring to you a mesmerizing blend of wine and tea in their latest collection of ‘Wine Inspired Teas’. Take a whiff of the soul-tantalizing aromas of the fruity ‘White Champagne Raspberry’ or dive into the floral fragrance of the colourful ‘Sicilian Vespers’. But if you like it strong try the powerful ‘Assam Jungle Cabernet’. For the true connoisseurs, we have the single malts of the tea world- the ‘Darjeeling First Flush’ and the ‘Risheehat Darjeeling First Flush’. We are bringing together the best of both worlds, in a ‘Tea Tasting’ session only at The Bombay Store, PM Road- Fort, Mumbai, on Friday 20th July & Saturday 21st July, from 1.30pm to 7.00pm. The Great Bombay Store Sale!!! 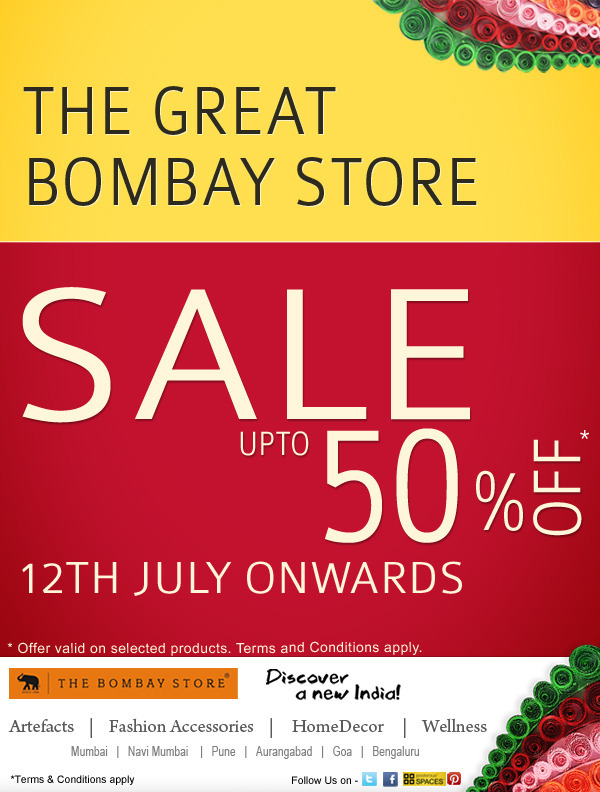 The Great Bombay Store Sale has finally arrived! Irresistible discounts Upto 50% on a wide range of products. Shop for Personal care, Home Décor, Artefacts, Fashion Accessories and make the most of this opportunity. You can stock-up on a tempting collection of stoles & scarves, trendy jewelry, party bags, clutches, wallets & a lot more. We have something for everyone, and for your home too. An eclectic collection of Home décor, Artefacts, Tableware, Bed Linen, Crockery items like- Trays, Coffee mugs, Tea Cup sets, etc. Brighten your office space with vibrant and funky ‘The Elephant Company’ products.You may also welcome the upcoming festive season by making the most of the discounts and buying a lot of gifts before hand for Friendship’s Day, Rakshabandhan & Independence Day. Avail Upto 50% off and other in-store offers at all The Bombay Store outlets! The Great Bombay Store Sale is here and you all are invited. We have decided to exclusively pamper our online fans and shopping members by holding a special Preview Sale. Come and shop before the crowd rushes in and the racks begin to empty out. Get the best of the lot and avoid the sale rushes! We offer you the opportunity to shop in peace, with personal attention and a whole lot of stock that is up for grabs. Choose from a wide variety of Fashion Accessories, Home Decor, Stationery, Wellness products, Tableware & more! Drop in for the Pre-launch of the sale and get all your favourite products that you’ve always wanted to buy, at rock bottom prices. WRITERS’ Paradise, The Blog a thon – An Aftermath! We recently launched our newest store in Bangalore with a huge fan fare on social media through a Blogging Campaign. It helped us connect to the fans in a manner acceptable to them. ‘The Bangalore Blog-a-thon’, was dedicated to all the writing lovers. The campaign was split in two phases, the first being a qualifying round. Here the bloggers were given 3 topics to choose from and flaunt their writing skills. The blogs were judged and four wordsmiths stood out of the lot. They were shortlisted for the final round. Four young bloggers- Hrish Thota, Pranita Mehta, Rakhee Shamihoke & Disha Shetty, armed with their pens & cameras and the will to create a writing history, took a tour of our newest store in Bangalore, situated at the sprawling 1 MG Mall. The store staff guided them along and solved their queries. The bloggers took pictures to support their blogs. The results were overwhelming. The blogs were a reader’s delight and spoke oceans about their expertise at writing and their fondness for the brand. They wrote about the ambience of the store, the unique feel of the merchandise, the display and more. Choosing the winners was a tough call, but the best came shining out- Hrish Thota & Pranita Mehta.